Piglette presents a special selection of sailing and boating gifts. Whether you know someone who loves sailing or boating, or if you simply enjoy these marvellous pastimes yourself, you'll find some particularly useful equipment and accessories from highly respected suppliers here. Just click on the pictures below for prices and further details. If you're fortunate enough to live by the ocean, you know that the sea has its own time schedule. The moon teases us using its gravitational pull to pull the tidal waters to and from the shore twice every twenty four hours and fifty minutes. 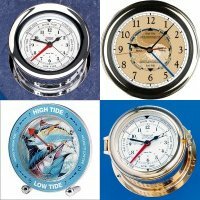 A handy tidal clock keeps track of this for you, so you will know when to take your boat out or bring it in. It will allow you to concentrate on more important things, like when the fish are cascading around your boat at the inlet or when to take a trip out to sea searching for dolphins.. They are available in many designs for all tastes. Perfect for traveling boating camping or fishing, this Five-In-One TV LANTERN feetures a TV with 3.4" diagonal screen, lantern that rotates 360°, flashlight, plus an AM/FM radio and an emergency siren. Countless uses on outdoor trips, or in your home garage shop or yard. It is constructed of durable high-impact plastics, with a weigth of less than 7 lbs, a molded-in carry handle (optional shoulder strap also included) and a compact space-saving design. Operates on 12-volt DC (cigarette lighter adapter included) 9 C batteries (not included) or 110-volt household current (adapter included). Features full-range speakers, telescopic swivel TV antenna all TV controls (vertical hold brightness and contrast) and headphone jack included. 6"W x 12"H x 10"D.
Using the same technology as employed by Desert Storm pilots, now declassified for civilian use, the versatile Nighthawk Microlight is so small and lightweight that you won't even know you are wearing it. The high intensity light which is produced, provides 5000 mini candela power, and will allow you to work efficiently yet preserves your night vision. The high tech LED bulb never needs changing, and is always cool to the touch. It is great for almost any nighttime activity, from boating, camping, flying and fishing to map reading, photography and car repair. The Microlight attaches to any finger using the included Velcro  strap for "point-and-shoot" illumination. You'll be able to see what you are doing with no more struggling or holding flashights in your teeth. The Microlight is used by aircraft pilots to illuminate cockpit controls, travellers use it for checking maps, parents use it to check on sleeping children, nighttime joggers use it to read pedometers and heart rate monitors, and the list goes on. It is weatherproof, with a manufacturer's lifetime warranty, and comes with 2 button batteries. These 8x25 mm fogproof and waterproof binoculars from Cstar Optics® combine form and function with a sporty, contoured design and a black rubber body for an improved grip and protection from impacts. The Porro prisms are coated to offer a bright and clear image and the chamber is filled with nitrogen to ensure no moisture build-up. Perfect for a boating or sailing trip, these bright binoculars include a useful built-in compass and come with a handy case and neck strap. The Tech40 Halogen Waterproof flashlight from Princeton Tec provides the highest power-to-weight ratio of any light in its class. Ideal for boating or sailing, it weighs only 5.1 oz including its 4 AA batteries (included) which provide the efficient halogen light with 3.5 hours burn time. Its palm-sized design will fit easily into any diver's BC pocket and works well as a back-up or for daytime exploration in unlit areas. It comes with a lifetime warranty. Kenwood's Free Talk WX 2-Way radio features a NOAA weather radio built-in so you can keep track of weather conditions when boating, camping or just outside. It has 14 channels, a large LCD display and a 32-step variable volume control. A textured, slip-resistant case makes it easy to hold. Please bookmark Piglette for all types of useful and exciting gifts, plus traditional presents too, including roses, flowers and much more. Many more sailing and boating accessories at our sister site, Jade Blue Waters.